This topic is required just to speed up your calculations and to solve the question of Remainder theorem asked in competitive exams. It’s not possible to remember each rule of each number. 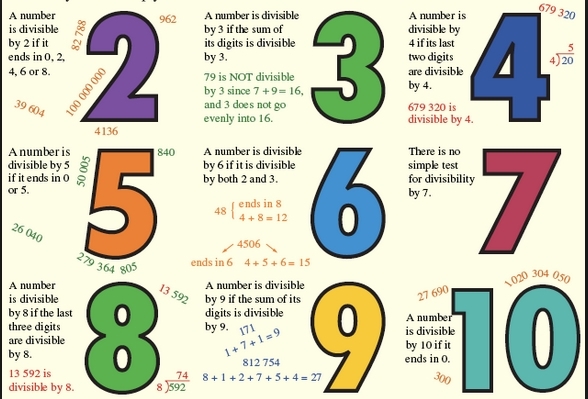 Just, learn from 1-20 and; I’m sure from 1-10 you can easily perform divisibility of any number and then, you just have to remember divisibility rule of 11-20 which can be helpful in SSC LDC, FCI, CAT and other exams. One is on Wikipedia (Click here), here you will see divisibility rule of every number from 1-20 (especially required for competitive exams). This link is also useful as rarely anyone provides divisibility rule of '7' or '13' numbers. But, you can learn it from Wikipedia source and a big length explanation was also given. Other is on Maths fun website (click here)- This is really good for small and easy tricks to speed up calculations. Comments "Divisibility Rule for Competition Exams"